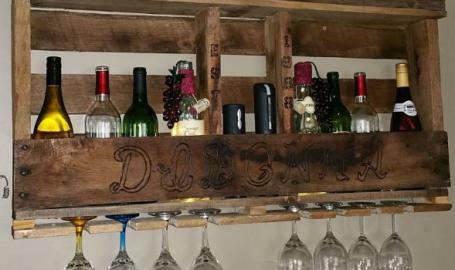 Customize your very own wine rack. We will provide 17 different stain options. We will bring these 4 paints, unless another color is requested, black, white, off white or gray.. Stencil colors are limitless. If you've ever attended our classes, you know we will have many stencils available for your embellishing. Included is one complimentary glass of your favorite Anderson wine. Snacks and more wine will be available for purchase. *Note that these are reclaimed pallet wood. There will be cracks, knots, imperfections to add to the character of your piece. Each one is a little different color, character and design. Have questions? Feel free to message Didonna Crafts. You're also welcome to call or text us at 219-508-6145.